Available from Macey’s Electrical , the Megger TTR100 is an automatic single phase handheld transformer turns ratio test set that is suitable for measuring the turns ratio, excitation current, phase displacement, dc resistance and polarity of windings in single and three phase distribution transformers. These transformer turns ratio test sets are battery operated and can be used with one hand, eliminating the need for kneeling or bending over to operate the instrument, helping to speeds up testing time. The TTR100 is robust, with a high impact, shock resistant case; however, they are lightweight (weighing just 3.3 lb). Providing reliable results, these handheld transformer turns ratio devices are ideal for testing in substations and transformer-manufacturing environments. The device features a high contrast LCD screen that is even viewable in bright or ambient light. The TTR100 is supplied with specially designed leads that offer the necessary flexibility needed in all weather conditions. 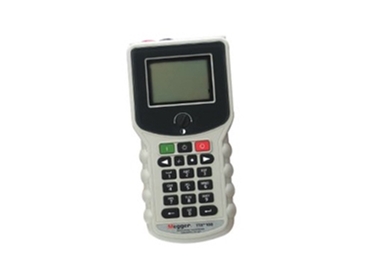 TTR100 handheld transformer turns ratio test sets are supplied with sufficient onboard memory for storing up to 200 test results and 100 user defined transformer settings. Test results can be printed to an optional serial printer. These transformer testers are also supplied with a Windows based software program that allows the download of test data from the instrument to a PC database.